Well we beat the rain, but not the coldâ€¦â€¦. Somebody let me know where warm spring weather is. But in spite of all this we had quite a day of great golf. We had low round of day a 75 from Jared Beard and our newest member Aaron Kersey with an eagle on the par 5 4th hole. And I want to compliment you all on pretty good pace of play, inspire of the course setting us up with wrong tee times. And I also want to again congratulate GARRY COLLINS with a free round of golf because he referred 3 players who joined the tourâ€¦â€¦ I will send out another note on this. 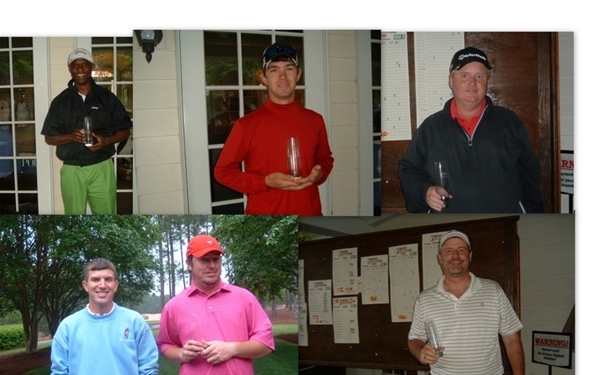 CHAMP FLIGHT; We this turned out into an unusual matchâ€¦QUENTIN YARBOROUGH and AARON KERSEY tied after 18â€¦at 77. Then while we were checking scores they went out for a sudden death playoffâ€¦â€¦. And 9 holes later!!! YARBOROUGH was the winner. A nine hole playoff, don’t know if I ever saw that, sorry we weren’t able to follow them around. Great playing!!! A FLIGHT; Another good match.. JARED BEARD finished whit a 75, which was low round of the dayâ€¦. And waited around to be sure HIRAN HICKS did not beat it. He came close with a 79. B FLIGHT; MIKE HUGHES had his best round of the tour 81and was able to beat LAWRENCE WHITESIDE who had some problems on the front and finished with an 85â€¦. C FLIGHT; KIP NEIKIRK the visiting pro from the Augusta tour, had a super round 79â€¦ to run away with this flight. D FLIGHT; we had another tie at 88 WILLIAM HINSON and DWIGHT WILLIAMSâ€¦ and this one we played off the card and WILLIAMS was the winner. SKINS; CH& A FLT $9EA HIRAN HICKS 1, JEROME CHERRY 1, AARON KERSEY 1, WAYNE SIMS 1, JOVYER TEJEDA 1, ISHAAN VASUDEVA 1. B, C&D FLT $17EA STEPHEN GADSEN 1, WES GENTRY 1, DAVID GOODWIN 1, RUSSELL LAMOY 1, KIP NEIKIRK 1, LAWRENCE WHITESIDE 1, HAL PARISH 1. SUPER SKINS; $58 EA JEROME CHERRY 1, HIRAN HICKS 1, LAWRENCE WHITESIDE 1, KIP NEIKIRK 1, AARON KERSEY 1, JOYVER TEJEDA 1. OUR NEXT EVENT IS SAT 5/18 AT WILDEWOOD CC â€¦.. THIS IS OUR FIRST MAJOR, AND IS WORTH DOUBLE POINTSâ€¦. PLUS WE WILL HAVE SOME SUPER TROPHIES. PLEASE LET ME KNOW IF YOU’RE PLAYINGâ€¦.. AND DON’T FORGET TO INVITE PLAYERSâ€¦. REFER 3 AND YOU CAN PLAY FOR FREE!!! !